I almost missed this month's entry. It has been insane, with work travels to Atlanta and LA, and that on top of this being my busiest month of the year at work. It is lucky that Christmas falls when it does, because otherwise I don't think I'd survive. I think I might be the only person who looks forward to February each year. Juxtapoz is excellent - art without stuffiness and pretention, but still real articles on the topic. More articles than advertising, that is always a treat to see. 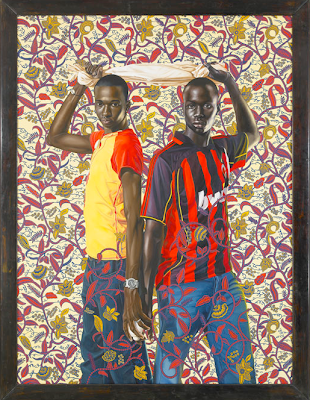 Their cover artist on the January 2010 issue is Kehinde Wiley. 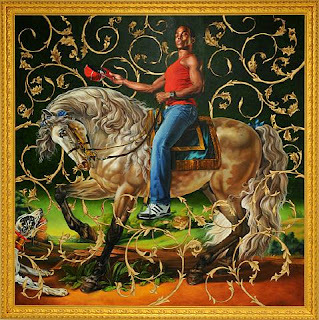 Kehinde Wiley is a painter. His style is something different for me, not something I would normally pick as a love. But, after finishing the magazine, I kept coming back to the pages with his images over and over again. I keep thinking about the meaning behind them. I am enamoured with his ability to freehand paint patterns. No digital cheating here folks. Saying that makes it sound like making digital patterns this complex is easy. Well, it isn't, but it is damn easier than doing it by hand. 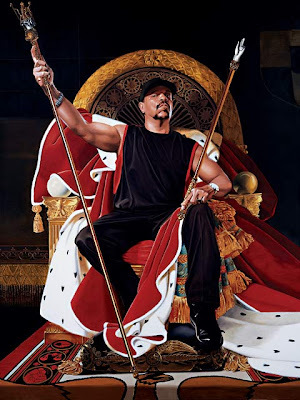 He paints portraits of youth - primarily African American, sometimes of other cultures or races, but always the underserved male youth. 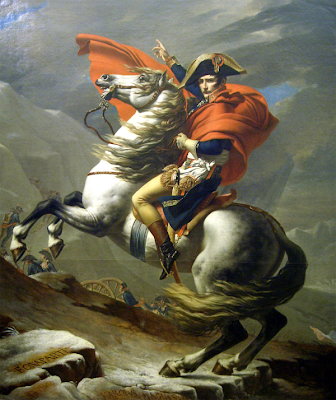 He places his subjects in settings that will feel familiar to you if you study art history - history at all really, as he places them in typical poses from early 19th century portraiture or Renaissance portraiture. The work is so engaging because the artist is clearly a master - his attention to detail, the style, the painterly strokes. But it is also totally current - relevant to today's youth culture and yet is haunting because of the oddness of the pairing of these two eras. 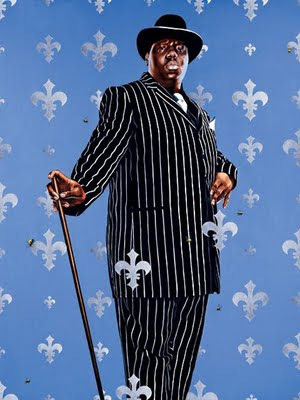 I find his work compelling because of this contrast, but also because I feel the artist is also commenting on white arrogance. There is, among a certain generation, or personality, in white folks, the inclination to find offense in black arrogance. Personally I find arrogance refreshing, I find confident people the most interesting. But I am specifically thinking of my (or your) parents "not getting" rappers braggadocio - or the "controversy" regarding Usain Bolt's "arrogance" at the last Olympics. That sort of thing. That sort of racist thing. Because somehow, despite the oddity of this portraiture, people still hold it in very high regard. And likely wouldn't question the confident nature of the subject. Aside from all that thinking hard stuff, his images are really cool to look at. Juxtapoz has nice full page reproductions. 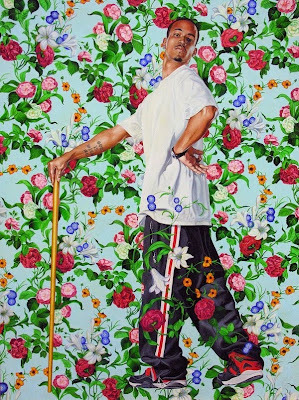 Kehinde Wiley is also gay. Maybe this shouldn't be mentioned in this post, but it seems significant to his work to me. Should I mention it? I did. 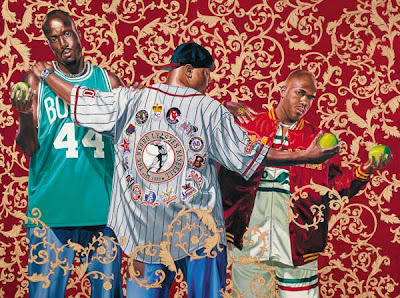 Accepted in the hip hop community, Kehinde was comissioned to do a number of portraits for the hip hop honours. 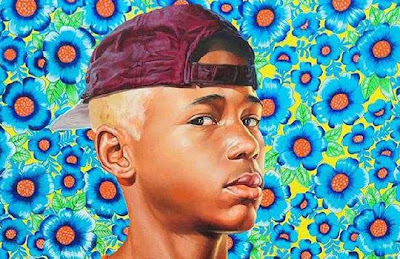 Hip hop & gay don't usually ...typically go together, so that is pretty interesting. And good.